Eventually the much awaited weekend was upon us and the squad arrived without a hitch at Daventry Court Hotel. The A team knew 3 wins would ensure promotion and believed 2 wins and a draw would probably suffice. The problem was that our opponents would have similar expectations so we were sure of a tough time. 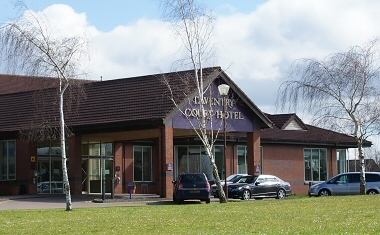 Daventry Court Hotel with 155 bedrooms, free WiFi and parking. The B team were playing for pride and the joy of the challenge. This team found themselves pitted against players rated between [ECF grades] 220[!] and 196 on boards 1-5 so there seemed to be greater prospects of a challenge than of joy. In the event we came close to a surprise draw with this formidable Fermented Sharks line-up. On board 6, David Hulme, following a season of keeping the bench warm, became the last of our 19 player squad to actually play and did not let us down. David seized the initiative in the opening and direct attack led to material gain; the conversion to an easily won ending gave us the perfect start. Andy Mort drew with ease on board 4 and John Cooper held with aplomb after coming under pressure on board 2. Richard Bryant and Steve Connor fought sustained rearguard battles but eventually succumbed. The play of Steve's opponent Alan Agnew particularly caught the eye. This left Dave Robertson in play deep in an ending with a piece against 2 pawns; his opponent Emanuel Maleki was not for lying down however and Dave had to settle for a hard fought draw. The A team rallied after the last weekend's disappointments and although not having things all our own way, eventually took control of the match against West is Best 1. Michael Johnson on board 6 grabbed an exchange in line with some Grunfeld variations; however opponent Matthew Davies showed that this line was good for white and his victory could not be denied. I had taken the quick draw on offer after obtaining a somewhat inferior opening. Peter Ackley on board 5 won extremely smoothly with the white pieces and the captain made a mental note to risk giving him white again someday. We took the lead when Nick Ivell on board 3 played a lovely game based on the theme of keeping opponent William Taylor's king in the centre. This required a neat combination from Nick to thwart counter-play and switch to an easily won ending. Brett Lund looked close to a win on board 1 but met with stubborn defence and had to settle for a draw. Thus Martin Mitchell was left playing on board 4, nurturing a slight endgame advantage which eventually became overwhelming, thereby securing us a 4-2 victory. 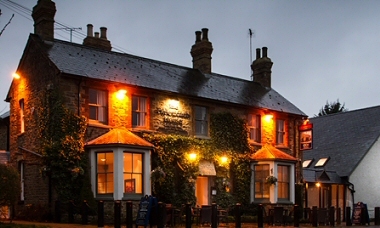 The evening meal was held at a new, to us, local gastro-pub ["Sophisticated yet familiar food wrapped up in a comfy countryside pub" is how they describe themselves] and proved very successful, complemented by appropriate drinks, at helping the assembly unwind. Our WAG of the day did add slightly to the stress levels by setting fire to a couple of table napkins in one of the abundant tea lights. I can assure concerned readers that not a drop of wine or beer was wasted in overcoming the blaze and that the interruption to the profound conversation was only temporary. The customary nightcap in the bar saw a relaxed squad retire in good spirits. The new day brought new challenges with the A team drawn against Sussex Smart Survivors and the B team lined up against Warwickshire Select 2 in round 10. This latter match proved an even affair with 2 wins apiece and 2 draws leading to a 3-3 result. Dave Robertson on board 1 and Steve Connor on board 6 were well worth their wins each in their own style. Steve favoured a manoeuvring style, gradually gaining control across the board and Dave preferred mixing it from an early stage. Equally, Michael on board 2 and Richard on board 3 never really recovered from poor openings and the Warwickshire players were well worth their wins. Andy on board 5 had a short draw which arrived at a pretty lifeless position pretty quickly. John on board 4 made more of the running but a draw was a fair result. The A team started brightly with Andy Smith soon on the attack on board 6 and Peter Ackley looking to mix matters on board 5. Martin and Nick seemed to be making steady progress with the white pieces on boards 4 and 2. Boards 3 and 1 were not looking too hot for Brett and myself. As the match progressed we became mightily impressed with the opposition young players. We got two early wins for Peter and Andy but Brett fell, despite resisting with every fibre, to David Graham who showed impressive attacking flair. 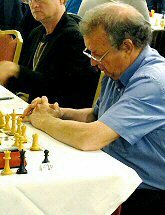 Martin also lost despite appearing comfortable on the board at several junctures; David Grant kept conjuring up possibilities and showed great energy throughout. The top two boards showed big swings; I won on board 1 when having shed a pawn, I was able to drum up swindling chances which landed a knockout blow. So we were 3-2 up with Nick in play against Zhuo Ren Lim, who from a worse position, played at tempo and kept the pressure on Spirit of Atticus's finest endgame player. Eventually Nick cracked with a draw in sight, but none of us could have expected to do any better. You've seen these games of Carlsen where grandmasters wilt under sustained pressure, well this game was like that. So 3-3 it was. And our view of Sussex Smart Survivors? Well, we will take their word on the Sussex part. They are undeniably smart and round 11 would determine whether they [and indeed us] would be survivors. The meal at another local gastro-pub [passionate about food with a charming rustic bar], also new to us, was enlivened by Entertainment Secretary Dave Robertson's annual prize giving ceremony. In accordance with tradition Dave not only supplied copious wine for the assembly but also copious bubbly for the toasts and the pre-emptive jubilation/despair of the morrow. Further, trophies were supplied for the "Players of the Year" for each of the four seasons of the existence of the Spirit of Atticus. These were; 2011: Peter Ackley. 2012: Nick Ivell. 2013 :Sheila Jackson. 2014: joint winners Martin Mitchell and Brett Lund. There was one other prize which I was honoured to receive although in the cold light of day I realised it was not the most competitive category ["Captain of the Year"]. 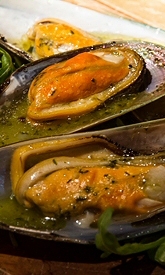 Again, the meal itself went well and a relatively early departure from the bar was the order the day with the final round awaiting us. The B team met Broadland and again a close match resulted. A single win for each side was the outcome. John Cooper blundered in the opening and ended up 2 pawns down; try as he might this proved impossible to redeem. On the positive side Richard Bryant trapped his opponent's bishop deep in its own camp and a speedy victory was the outcome. The other 4 games were tightly fought with a fresh Sheila Jackson arriving to bolster the morale. Sheila drew with ease; Andy Mort decided discretion was the better part of valour as his advantage began to slip for his draw. Steve pushed hard without quite breaking through and Michael rediscovered some zest and played many moves before a draw was finally agreed. 3-3 then and a creditable first season for the B team, being top of the 50% brigade on SOS in the League table reflected their tough playing schedule. At the start of play the A team were one of 5 teams in joint 4th place with 14 points. The runaway leaders Guildford 3 had 19 points followed by Anglian Avengers 2 and our opposition in the final round e2-e4.org.uk 2 each with 15 points filling the first 3 places. The atmosphere was electric in the top 4 matches involving these 8 teams and it was hard to envisage results which would allow us to obtain promotion with anything less than a win. The results started to arrive in the 4th hour of play. Dave Robertson [in on board 6 for Peter Ackley who was missing his first Spirit of Atticus match in the 4 year history of the team] obtained a decent opening with the black pieces but slipped to the edge of defeat before scrambling to a draw. Nick on board 3 had a notional edge in the early stages of his game but an apparently inevitable draw was agreed in due course. The game which initially attracted the least interest from the supporters was Brett's game against Michael Barnes on board 1. As the game moved on it became clear that Brett was unwinding a deceptively simple demonstration of the exploitation of a small advantage and this in due course put us one ahead. Students of Chaos Theory are often attracted to Andy Smith's games and his match against Alan Byron on board 5 provided excellent study material. After myriad complications Andy forced a draw by repetition as the match seemed to have turned decisively our way. This proved to be an accurate assessment as my game had flared up and after the smoke of battle had cleared I had a winning endgame. Eventually the win came and we were home. Martin on board 4 had made the running for much of the game against Andy Morley but when his position had slipped neither player had the stomach to prolong the fight and a draw was agreed to give a final score of 4-2. Our experiences force us to share the good news: if you are not part of the 4NCL then get involved in playing in the best team competition in the land. In particular The Northern League provides great venues and the intense yet friendly competition that characterises the 4NCL in general so if you are a predominantly Northern team that travels South then join us, you will not be disappointed. Equally if you are a Northern team contemplating joining in, contemplate no more, do it! You will not be disappointed. As ever the chess community is indebted to the fantastic team who continue to work tirelessly on our behalf. Thank-you to every single one of the 4NCL workers. Special mention has to made of Mike Truran's continued energy and vision which shapes the efforts of the brilliant 4NCL team.